The most powerful catalyst for my child’s inclusion has always been the teacher’s attitude and skills. I have noticed 10 key qualities. " 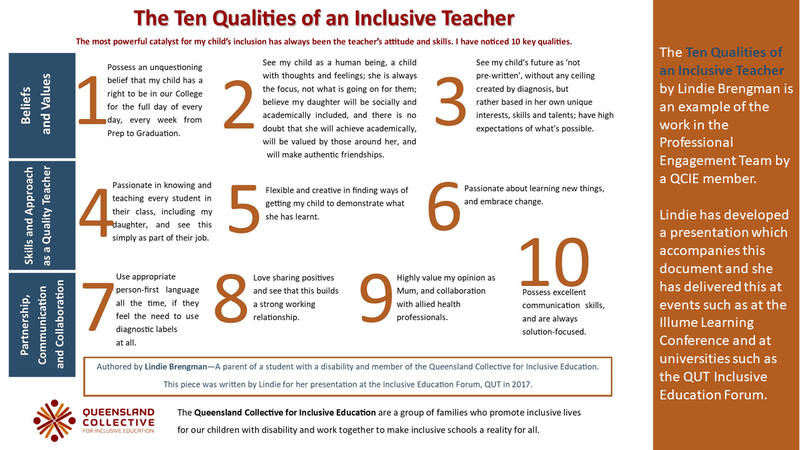 Lindie Brengman—A parent of a student with a disability and member of the Queensland Collective for Inclusive Education. This piece was written by Lindie for her presentation at the Inclusive Education Forum, QUT in 2017.
recognition of and support for parents’ advocacy for their child. SINE Network is a national network of @AllMeansAllAus led by educators supporting each other to initiate, develop and sustain inclusive schooling practices for ALL. All Means All is the Australian Alliance for Inclusive Education, a nationwide multi-stakeholder alliance of people and organisations working together to implement an inclusive education system and remove the legal, structural and attitudinal barriers that limit the rights of some students, including many students with disability, to access full inclusive education in regular classrooms in Australian schools. This Inclusion Toolkit for Educators has been written with leading inclusive education experts to assist educators to welcome and support diverse learners in their classrooms and schools. Thank you Starting With Julius IncludED initiative for collaborating on this shared resource. Recently we worked with a school on their journey to seek, include, and act upon wellbeing matters identified by students. 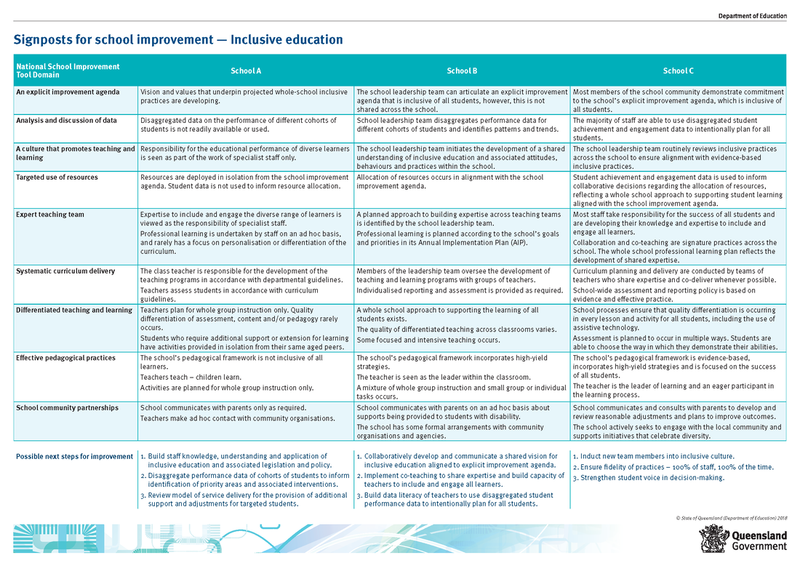 Through this process, the school evaluated, refined, added, and developed student wellbeing provisions to connect directly to what mattered to students. Throughout the project (funded by QLD Government Horizon Grant), students valued being able to “work on something that’s impactful for the school… normally we don’t get to do that kind of thing… Teachers and adults are [now] able to see our point of view of things that are happening around the school” (Grade 9 student) and actively contribute to enhancing the school experience. Students referred to developing greater confidence in themselves, as well as leadership, and transferable academic and critical thinking skills as a result of their project activities.